So, it’s Nanowrimo and we’re all weeping at typewriters: time to tackle some of those juicy (and often bought-but-ignored) books on how to write. I’m starting with this one because it was recommended by a well-meaning relative. If you’re about to take your first steps as a writer, and need a lot of coaxing to come out of your shell, this would be perfect. “Yes, little Timmy, you can say the people look like ants if you like, that’s what being creative is all about.” If, like me, you’re an arrogrant brat that doesn’t doubt that you can write (you just wish you did it better and more often – natch. Wink wink, nudge nudge) then this doesn’t have much more to add to the process. I’d recommend Bird by Bird Some Instructions on Writing and Life by Anne Lammott for some more in-depth advice, plus a truly human touch of neurosis, warmth and humour. Stephen King‘s On Writing is also very good for unpretentious advice on the craft, though in that book the advice/writing experience is very much mixed with King’s memoir. Depending on how much of a King fan you are this could be a big plus or a lot of filler. If you’re full of trepidation about putting pen to paper – by all means get Writing Down the Bones to give you a cozy glow inside and hopefully enough ego boost to get writing. Give it a miss if you have cynical tendancies or previously successful creative writing. 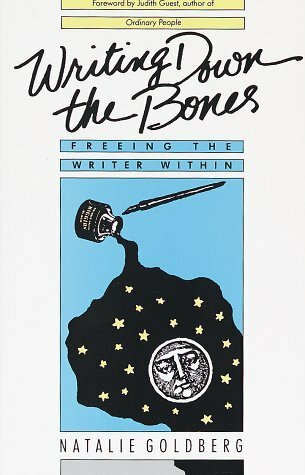 Posted in Arts, Blog, Book reviews, ReviewsTagged book on writing, Creative Writing, encouraging, for beginners, I could take it or leave it, meh, natalie goldberg, writing down the bonesBookmark the permalink.